Does not include remote receiver. See PA-30 if remote receiver is needed!! The Pool Patrol PA-25 Pool Alarm floats on the pool surface and will activate when children or pets fall into the pool, creating a wave. The Pool Patrol emits a warning alarm when the wave touches the sensing ring of the pool alarm, the alarm is triggered, emitting a clear warning signal. The sensing ring is adjustable so that it can be controlled to activate only when an object the size of a child or pet falls into your pool. The Pool Patrol is designed to work in any shape pool. For pools larger than 20' x 40' more than one alarm may be required for greater security. The Pool Patrol Pool Alarm comes with easy-to-use tie-down strings and hooks. This enables the Pool Patrol Pool Alarm to be secured to the side of your pool. The PA-25 Pool Alarm is easy to install, convenient to use. It helps detect intruders. It floats on pool surface, is battery powered, and has a Low Battery indicator. The PA-25 Pool Alarm is corrosion-resistant for long life. It is ideal for both inground and above ground pools, and it also protects commercial pools and spas. The PA-25 Pool Alarm has the electronics to transmit to the in home receiver but does not come with one. Have a spa and pool? Want the added comfort of two alarms in your pool? Only want one receiver that will sound for both alarms? Then you want to buy this alarm as an add-on to the PA-30. IMPORTANT! 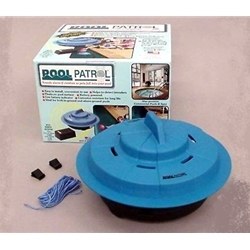 Read instruction inside box before using your "Pool Patrol" Pool Alarm. The use of the "Pool Patrol" Pool Alarm System does not replace constant adult supervision necessary at pool side.